To engage customers, marketing automation software is a key part of the online marketing process. But marketing automation is not just about the management and efficiency of relevant, fresh content and campaigns rather it is how quickly and accurately it can engage customers during their buying journey. 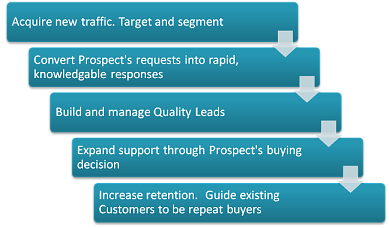 Leadables’ marketing services work these processes to bring you targeted, high-quality leads and support for superior conversions. Exemplary marketing services help to develop and expand the personal relationship you have with your customers and prospects. Marketing Automation starts with the development of sound strategies. Your online marketing strategy is based on good market data which will help your site. To engage more customers, the content and campaigns must match the right target audience. In addition, the strategic use of both content and campaign channels are key tactics to engage and convert your prospects into buyers at the right moment. Marketing Automation software lets you do that by tracking visitor behaviour and responding to their requests in real time. Marketing Automation systems support both Inbound and Outbound marketing campaigns. For Small-Medium businesses (SMBs), Inbound Marketing is most effective and less costly. It supports the strategy of Youtility marketing – educating your prospects and customers not just about your products and services but also regarding best practices for their use. Engage your prospect rapidly – in real time. Provide personalized, targeted answers and information. Deploy marketing campaigns via multiple channels – website, email, search, social, blogging, etc. Monitor and analyze your prospect’s interests with strong analytics. See who is visiting and what they are reading or watching. Monitoring visitor behavior and getting insights into their interests and needs is the basis for the conversation you develop with your prospect or customer. Real-time ability is critical. Share important data about your prospect or customer with sales and customer service in a timely manner. Integrate what is happening online with customer management systems. Consumers look for rapid responses which satisfy their queries without necessarily going through a human interface. Automated responses based on user behavior and interests greatly supports the decision buying process. Achieve a higher level of personalization with your targeted audience using Rules-based personalization and targeted actions. Gain deeper insights into the behaviors and interests of your prospects and customers as they move through your campaigns and marketing sites. And respond accordingly. Improve Customer service, satisfaction and experience thereby increasing retention and yield.